These goatskin gloves have all the characteristics of a sports glove: ventilated TPU hard-shell protector at the knuckle, SuperFabric® panels at the little finger and PWR | shield at the palm. We could only get the connect finger tip to work on a samsung phone. It does NOT work on iphones. Please Note:* We can ship REV’IT! products to US, US territory or APO/FPO addresses only (per manufacturer’s restrictions). 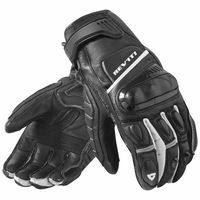 The Chicane glove by REVIT is a classic short cuff sport/race style. There aren’t too many gloves like this one the market. Most available these days are by Alpinestars. These glove compare favorably in quality, fit and price to the Alpinestars glove, and, I personally think, a more comfortable pre-curved finger design. These gloves are well armored top, bottom and side. The knuckles are covered by a molded protector which fits well and is made comfortable with memory foam fitted on the bottom side against your knuckles. And the knuckle protector has vents which are functional so you’ll flow some air through the glove for warm weather comfort. In the palm is a hard plastic slider which protects from impact but also promotes sliding on the pavement should you fall. Gloves without the slider feature will have more of a tendency to grab or twist upon impact. The outside of the thumb has some built in padding with a sharp quilted pattern of stitching through it. Also the little pinky gets some extra side padding as well. The way the fingers are sewn is a combination of inside seams on the top of the finger and outside seams on the bottom side. Its a very comfortable to wear design, and somehow it makes the gloves bend easily when you make a fist. These gloves are some of the best fitting “pre-curved” gloves I’ve tried.